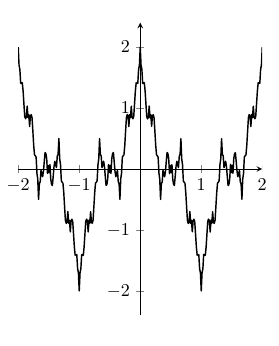 I'm trying to plot Weierstrass function using only basic TikZ picture functionality (no gnuplot or whatnot). How do I use sum in a \draw? Do I have to make a new command? Use a loop? 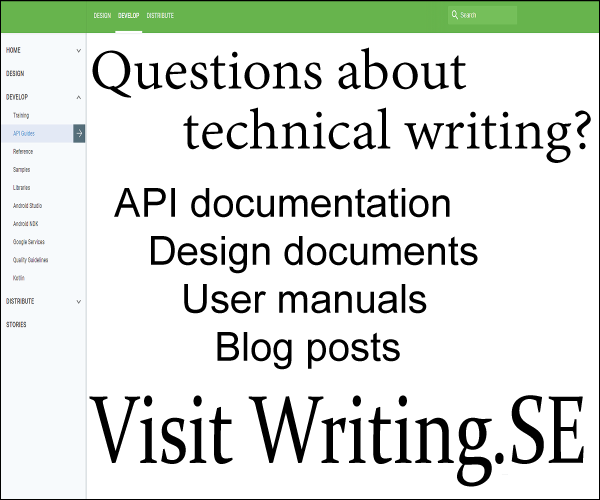 The following method is optimized for simplicity and readability rather than compilation speed or flexibility. The code avoids using LuaTeX, PSTricks, or even commands beginning with \pgfmath. The basic idea is to build the summation from the original question as a string (except that, e.g., 32 gets written as 2*2*2*2*2*1) and then pass this string to \draw plot in the usual fashion. Run the example with xelatex or latex->dvips->ps2pdf. You need the latest version of pst-funx.tex from http://texnik.dante.de/tex/generic/pst-func/ or tomorrows update of TeX Live/MiKTeX. 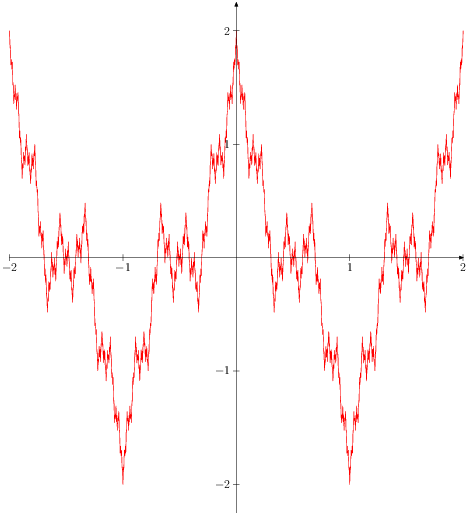 Here's a pgfmath function definition of the original Weierstrass function: weierstrass(x,a,b,i). 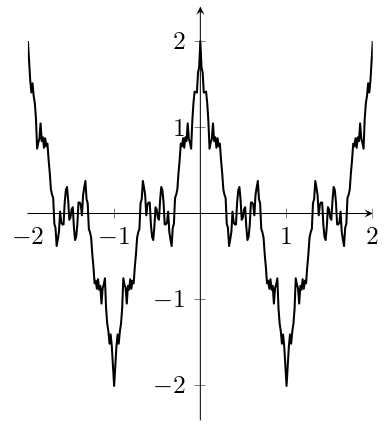 i is the number of iterations to be used for approximating the function. Jake's method using lualatex with pgfplots. Some nonsense seems to be required to convert to and from the internal representation of numbers used by pgfplots which makes this annoying inefficient. A sagetex solution combined with the tkz-fct package for setting up the axes and running in Sagemath Cloud. The x values running up to 2.01 are because Python doesn't implement the last number, so it actually stops at 2.
updated: package xinttools (for \xintListWithSep) for example, needs explicit loading: since 1.1 (2014/10/28), it is not loaded by xintfrac anymore. 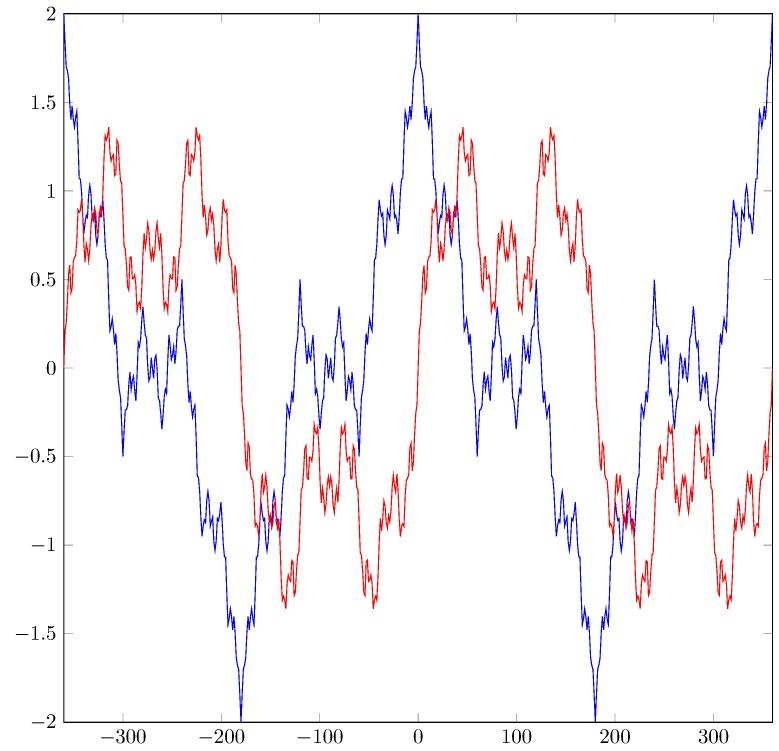 last edit: added a method using the fpu library with pgfplots, for the general \sum_n a^n*cos(b^n x) Weierstrass function. The powers a^n and b^n are pre-computed as floating point numbers with xintfrac, which also prepares the complete partial sum. I kept only 6 digits of precision as anyhow the fpu library mantissa computations are between 4 and 7 digits of precision. As the x axis will be in degrees, which is what cos and sin use, no need here to worry about a pi, it's all in the horizontal scale. See bottom of answer for the result. Taking over Charles' solution, with the difference that the powers of two are now precomputed. 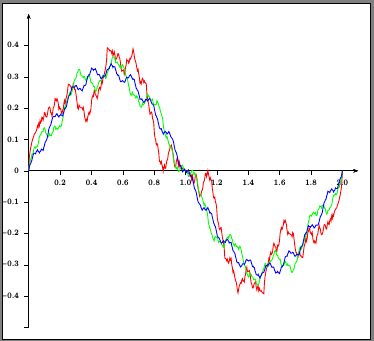 A partial sum expression is prepared using xint to pass to tikz's plot, with the fpu library loaded. 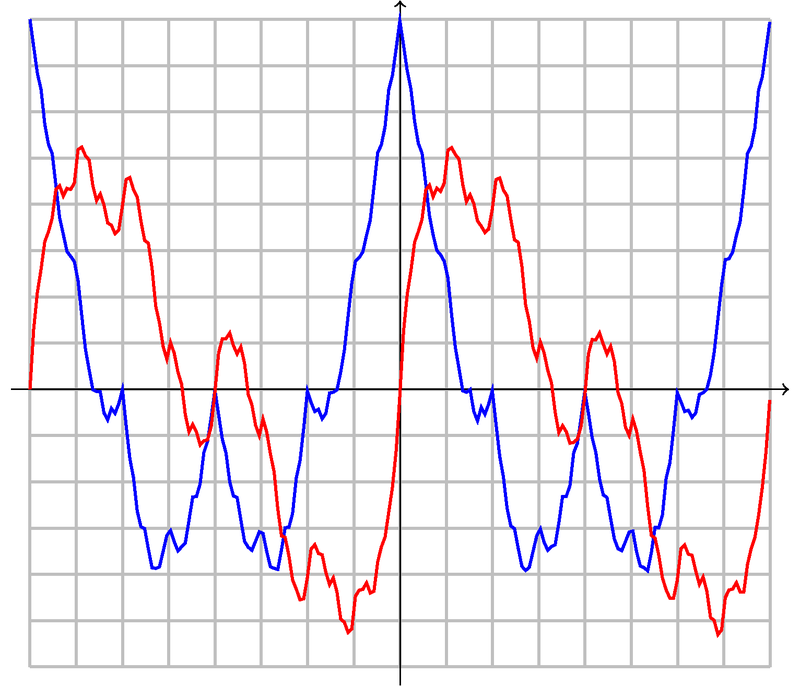 edit: the plots now use an odd number of sample points (101 vs 100, or 201 vs 200); hence are better looking at x=0. 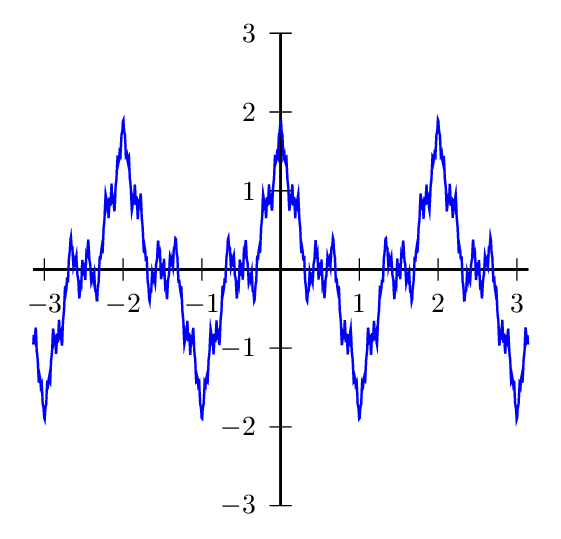 (only second image replaced, the one with n=20). Note: I don't know how tikz's fpu interfaces with the plot command, and I have noticed that with a too long partial sum (say n=30) an error arises:Dimension too large (but admittedly it does not make sense to handle that many terms which will be completely negligible). Thus, it seems some computations at least are not handled by the floating point library, presumably at least the additions? if everything was handled by the fpu there would not be a Dimension too large error, right? Besides, I use only 200 samples for n=20, else it is too slow. % we need pi and r to use radians. % to protect the \x, or \y which will be passed as argument. % odd number of sample points to get it right at the origin. height=12cm, scale only axis]% ENFIN! Since many of you have proposed non-tikz solutions, I've felt free to propose one which makes use of MetaPost. It has borrowed many elements of Herbert's very clear Lua-solution. 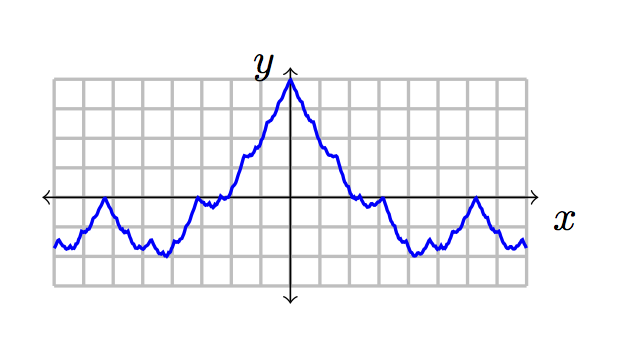 For a PDF version of the graph, run mptopdf weierstrass.1. Simplifying Jake's solution and it was taken (or stolen) from Herbert's idea. Not the answer you're looking for? Browse other questions tagged tikz-pgf plot or ask your own question. 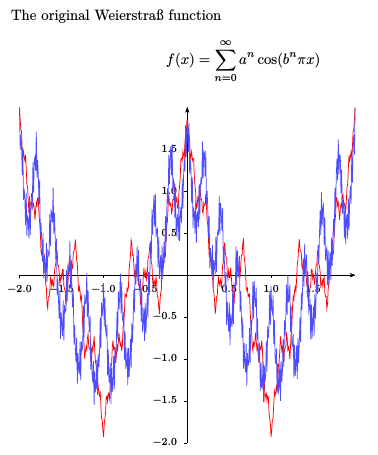 How do you plot the Riemann Zeta function using Tikz/Pgfplot?